A reckless bus driver killed a local high school student and injured another 21 on Friday afternoon, thus reigniting the furor over public transport safety in Guadalajara. The number 368 bus was speeding along the northern Periferico beltway – and reportedly racing a minibus – just before 3 p.m. when it slammed into a bus stop where students from the Preparatoria 10 high school were waiting. The driver, Leopoldo Martin Soberano Castro, 53, was sober at the time, assured Hernan Guizar Maldonado, the director of public safety in Zapopan. “He says two students tried to cross the street in an untimely manner. When he saw them he turned the wheel and unfortunately that’s when he rammed the bus stop,” Guizar said. But having failed to even brake, the driver then reversed – causing further injury to some of the victims – and tried to escape the scene of the crime. 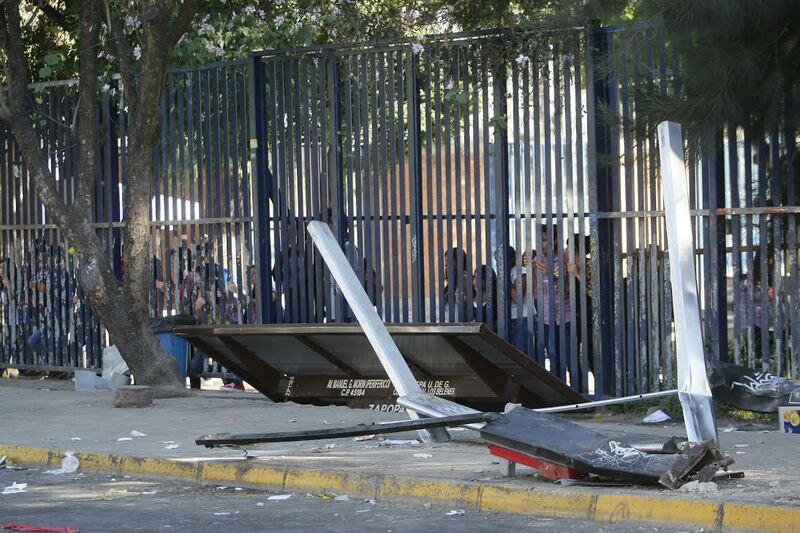 A mob of enraged students chased him 100 meters down the road and smashed one of the bus windows before Zapopan police arrived to arrest him and prevent a lynching. Eighteen-year-old Maria Fernanda Vazquez Vazquez died at a local hospital that evening, while 21 others were injured, several of them gravely so. Soberano is now being held in Jalisco’s maximum security Puente Grande prison. He faces murder charges and a possible sentence of 25 to 50 years. The parents of Vazquez Vazquez will be entitled to 336,450 pesos (US$25,000) in compensation while the State Council for the Victims of Public Transport will provide 12,500 pesos (US$945) to cover the funeral costs. This tragic incident put the spotlight back on the appalling safety record of public transport in the Guadalajara metropolitan area. Fourteen people have now been killed in the city by public transport in 2014, an average of one victim every four days, while 60 have been injured. Another 49 people were killed by bus drivers in Guadalajara in 2013, while 1,144 have been killed in the city in the last 18 years, according to Pedro Mellado, a reporter for local newspaper Mural. This appalling record has led to a rise in vigilantism against bus drivers in recent years. Eight bus drivers were murdered in two waves of violence in February and October 2012, in apparent revenge for the death of pedestrians hit by buses. Another bus driver, Marcos Gutierrez Muñoz, 40, was shot dead on Friday in Guadalajara’s General Real neighborhood, but this was an unrelated killing that occurred hours before the students were hit. The public University of Guadalajara, which runs the Preparatoria 10, cancelled classes and organized a large-scale demonstration on Monday. Some 400 students, reportedly accompanied by anarchist groups, marched through Guadalajara to the municipal palace, where they clashed with police. Nine demonstrators were arrested, while three police officers were reportedly injured. In response to the initial public outrage, the Jalisco government announced on Sunday that it had reversed a recent hike in bus fares, with the price dropping back from seven to six pesos, effective immediately. Yet this will come as scant consolation for those affected by dangerous driving, who have long demanded better, safer service from local public transport. Great articles! I really enjoy them all. Third graf, I think you want to say brake, instead of break? Thanks Carol. I did indeed mean brake! Have corrected that now, cheers for the heads up! I have been living here for 6 years and it bothers me so much to see how people roll over so easily for one peso, the people are liked caged animals no longer having the spark of life or freedom.